OSWEGO – The H. Lee White Maritime Museum at Oswego is pleased to present “The U.S. Life-Saving Service in Oswego” as its first installment to the 2019 History Lecture Series featuring Ted Panayotoff, coauthor of Lighthouses & Life-Saving at Oswego and former chairman of the city of Oswego’s Lighthouse Development Committee. 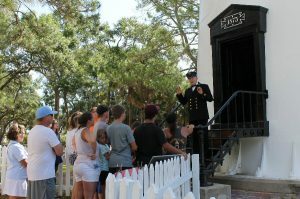 Pharologist and author Ted Panayotoff gives a tour of the Hunting Island Lighthouse in South Carolina in 2018. He returns to present a talk on the Life Saving Service. The lecture will feature a brief historical overview of the U.S. Life-Saving Service in Oswego which, as a predecessor of the U.S. Coast Guard, had a presence in Oswego between 1878 and 1915. Panayotoff will also dive further into the people, places, and events of the Life-Saving Service making use of images from Lighthouses & Life Saving at Oswego and other collections near and far. As a former resident of Oswego, he was instrumental in the Maritime Museum’s efforts to begin restoring and providing public access to the Oswego West Pierhead Lighthouse. He now resides in South Carolina with his wife, Jo, but they often return to Oswego to visit family and friends and to check on the progress of the Lighthouse restoration. As part of Arcadia Publishing’s Images of America series, Lighthouses & Life-Saving at Oswego features both iconic images of Oswego as well as those never-before-seen; presenting a unique visual journey of the maritime services between 1822 and today. The book will be available for purchase at the Treasure Chest Gift Shop that day and the lecture includes a book signing as well as a question and answer session for the interested public. This lecture will take place at the Maritime Museum, on the West First Street Pier, on April 13 at 1:30 p.m.
For more information about this program or other museum activities, visit www.hlwmm.org or call (315) 342-0480.